Graduation is a skill game on www.bestgames.pk in which you try to get a good academic performance by collecting scores in the air. Today is your graduation, but your GPA is too low. Here you get a chance to change your GPA. There are numerous score sheet flying in the air and marked with different GPA from A to F. You should collect good grades by fling into them to raise your GPA and dodge bad grades for they lower your GPA. You can fly around with your propeller hat and use W, S, A and D keys to move. A special gun is prepared to blast away bad grades and multiple hits with one shot give extra credit. You can use the mouse to aim and click to shoot. Try to get above a 3.5 GPA before time runs out. 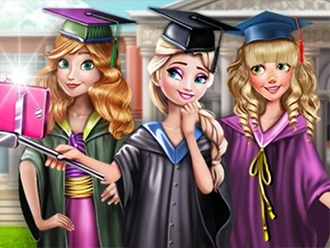 Anna, Elsa and Rapunzel graduated college and they want to take a selfie to remember this unique moment. Decide what the three best friends are going to wear and have fun trying on different robes, shoes and bags. Create a beautiful graduation outfit for each of them, then take the perfect selfie for their college album! There is graduation time and we all know what an important day is for everyone and how much these Disney princesses get prepared for this. Come in this dress up game and help them to find a suitable outfit for this event that will match the robe. Make sure you choose wisely and you offer them a special day with a remarkable look. Add a pair of shoes and a bouquet of flowers and let the fun begin. 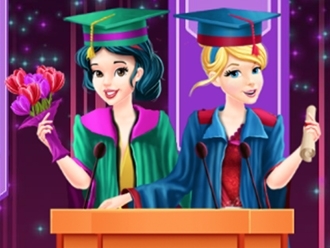 The princesses Elsa, Anna and Rapunzel are graduated from Disney High. They are looking forward to having fun at the Disney Graduation Party with their other princess friends Ariel, Cinderella and Aurora. Now they need your fashion advice on the party outfits. 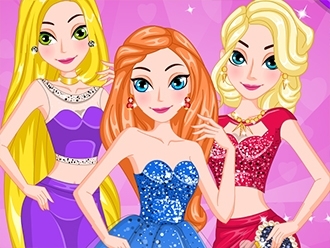 Help each of them design a fabulous party dress. Use your talent to decorate their dresses with different colors and patterns. Then choose accessories like jewelries, handbags and shoes to complete their party looks. Have fun! The graduation party for princesses is around the corner. It’s very important day for all princesses in all kingdoms. 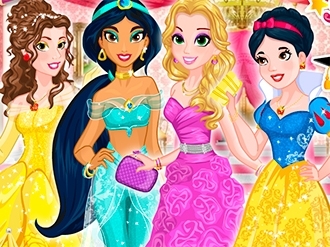 So, four BFF - Belle, Jasmine, Rapunzel and Snow White - decided to compete and find out, who will become the next Prom Queen? But first of all every of them needs to get a total makeover! And you are the one who should help them have an eye-catching appearance. Choose the perfect dress for every princess, add some accessories and don’t forget about cool hairstyle. No matter who will win - every princess will feel herself like a queen that night because of your perfect sense of fashion.